The trading systems and trading strategies that are described here can be applied to a variety of markets. I apply them to trading futures markets, but you can also apply them to trading stocks. They can also be applied to a variety of time frames, from weekly futures charts to minute futures charts. My favorite are 60 minute charts, and I will go into the reasons why in other sections of this site. Keep in mind that 60 minute charts are my preference and not necessarily your preference, or even the best time frame to use. 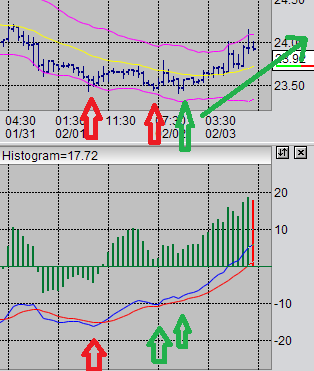 In these articles you can learn how to trade what is called an MACD divergence indicator. This is basically when the MACD is telling you that either the bulls or the bears are getting worn out and some type reversal is due. You can also learn about two different trend trading techniques. One is called swing trading and means that you buy in sync with a trend when the price shows value. The other is when you trade with the trend and you set your buy and sell orders based on the price breaking through price-levels. My favorite is the MACD divergence technique, but that is only my preference you should form your own. Forming your own time frame and trading strategy preferences is important. You can only get really good at something when you personalize it and make it your own. Personalizing something is a real indication that you are familiar and comfortable with related concepts. In my futures blog I mainly demonstrate my favorite trading system, MACD divergences. I try to give concise but helpful explanations of the trades so you can read about the particular technique here, and then observe it in action on the futures trading blog as I make real trades. I try and post them as fast as possible, but it usually takes me 20-45 minutes to get them up. Check the futures blog periodically, or follow @FuturesInfoNet at twitter, or Futures Trading InfoNet at facebook, and learn how to trade futures by following real examples. If you're wondering where I learned about these different techniques, it was by reading books first and then finding reinforcing material on the internet. Then, by trial and error trading. Some of the books I used to learn these trading systems are reviewed in my reviews page. Be sure to test any trading strategies and trading systems by paper trading before using real money. It usually takes me at least 4 to 6 months of watching a market daily, every day, to even begin getting comfortable and familiar with its behavior. Keep that in mind if you decide to start trading some of these trading systems in markets that you are not already well acquainted with. Also, make sure that you are very comfortable with your trading platform. If you're new to trading or are switching futures brokers, take the time to get comfortable with the futures trading platform before doing any serious trading.